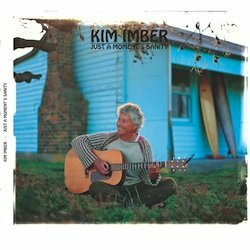 Kim Imber is a Tasmanian poet and songwriter who has just completed his third studio album called "Just A Moment's Sanity". This collection of 10 original songs has been recorded true to his live performance, with vocals, acoustic guitar, harmonica and percussion. Known for his lucid and insightful lyrics Kim's earth based rhythms alongside skilful guitar and harmonica playing put this album into a place by itself. Think Bob Dylan meets Jack Johnson. There are a range of songs on his new album. "Here Come The Pokies" is political satire at its best. And the title track is sure to get us wondering about that old question of whether we're insane in a sane world or sane in an insane world. Whichever side of the line you sit there's a bit of wisdom in this album that few contemporary songwriters can replicate. As a self-produced and recorded artist Kim is reasonably happy with the final product but its in his live performance where your spirit can truly be lifted. Kim performs regularly around Tasmania and in his 2nd home of Byron Bay. He is currently organising to extend his wings into Melbourne. Just A Moment's Sanity is a song that not only offers hope for humanity but a pathway forward. Covertly political and openly spiritual this song helps to reaffirm what those with an open mind may already know.